Today, our natural resources need the most amount of conservation and are slowly moving towards depleting. It has now become our duty to, in our own little ways, conserve them. One such resource is water. On a daily basis, there are a lot of instances where we see water being wasted mercilessly. While many people have adopted various ways to conserve water at home, it is now time that we take such proactive measures to do our bit for water conservation. 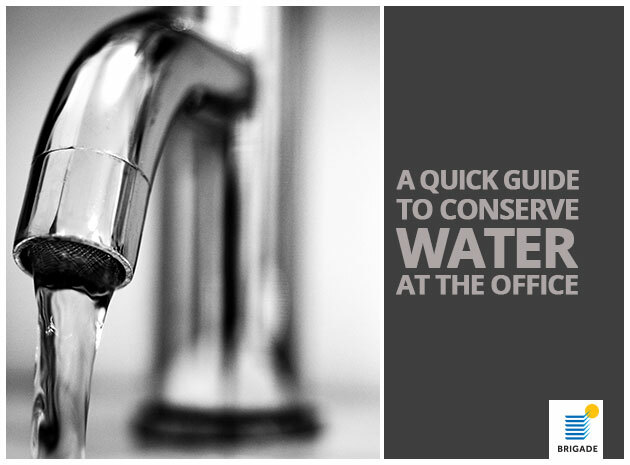 Keeping an aware eye out for leaking taps and showers is the first step towards efficient water conservation. If you find any open taps then take it upon yourself to turn them off. And also report to the administrative desk in your office to get any leaks fixed. Aerators are used to mix water with air, creating a more misty spray and using less water than conventional faucets. This is a very clear cut way of monitoring the amount of water that is being used. Having dialogues and workshops on topics like water conservation is crucial. So get your colleagues around and brainstorm on various ideas towards the cause like have a water meter, keeping taps shut, etc. Conversations around conservation are very important. Wherever possible, try to stick no non-water based cleaning solutions. For instance, sweep the floors instead is mopping them until absolutely necessary. Zero discharge design is a very new and effective way to conserve water. In simple terms, the zero discharge design utilizes advanced technological water treatment processes to limit liquid waste at the end of one’s industrial process to, as the name suggests, zero. Most of Brigade’s developments take proactive measures to conserve water and limit wastage making it as minimal as possible with special features in all the projects such as rainwater harvesting and zero discharge design. These being said, there are many other ways to conserve water and it’s the little daily steps that make a difference.